Tambora Urban Village and police are conducting a special guidance for youth group Karang Taruna. The goal is by making them as spearhead of prevention brawl. "We guide them and they obligated to run siskamling pattern (community patrols) "
“ We guide them and they obligated to run siskamling pattern (community patrols) . Starting from Binmas (Police's community development) and Babinsa (village supervisory non-commissioned officers), all elements must be active and mobile in 7 RWs,” said Dwi Kurniasih, Head of Tambora Urban Village, Thursday (9/3). According to Kurniasih, parents are also involved in prevention brawl. Because the primary education for children lies on them. "We provide understanding to parents to monitor their children's social life and activity," she expressed. 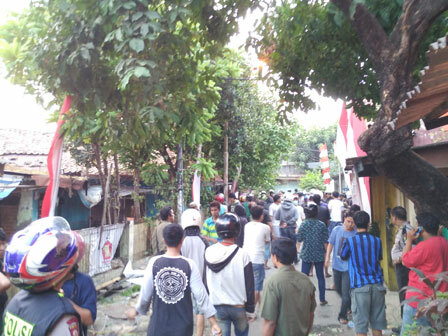 As known, Tambora area becomes a spotlight of people considering lots of people falling victims due to rampant brawl. "Usually, it happens on Saturday night. Alhamdulillah, it did not happen lately,” she uttered.